Nice country pub in quiet village. It has a good bar with two guest ales and serves food. I visited with some “out of towners” and we tried a selection of drinks, including both of the ales. We had food in the garden; both food and service was very good. I would recommend anyone to visit. Sorry to say I was very disappointed in our visit yesterday for Sunday lunch. Again, it was meeting family half-way between Southampton and London. I had the roast beef which I thought was priced at £13 on the menu but when the bill came, was £14. The beef was undercooked, rather fatty, and the gravy was a strange orange colour. For fourteen pounds, I expected much better. I had a double espresso after, and that was £3.55. The staff were friendly and attentive, but the prices were horrendous! The total bill for five people (4 starters, 3 roast dinners and two "child" portions, 2 puddings, one drink each, one coffee, one tea, and my espresso) was £112.90 ! Outrageous! In August, eight of us paid £106 for a similar meal in central London. Great pub in a great village. Atmosphere counts as if a place looks dodgy on the outside, it is usually dodgy on the inside. We went there for Father's Day. They were very accommodating when we had to change our booking less than 24 hours before. The food was excellent: a good choice without being so extensive that you know it just comes out of the freezer and into the microwave. The pub is dog friendly, there were several present when we were there. 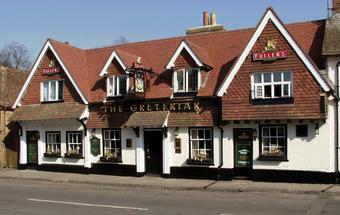 Great place to meet friends / family from London (we live near Southampton) as it is about half-way. Will be back again! Fullers (ex-Gales) pub - Seafarers, HSB and London Pride (not exactly enterprising). Good, if expensive food. However, service can be erratic and there does appear to be randomness and occasional very slow delivery of meals without explanation or apology. Large parties can hog the bar. Location good, especially for watching all the Jane Austen adherents from. Great pub. Coped with a party of 20 walkers on a weekday lunchtime flawlessly. The ale, the grub, the service all excellent. Good value too, considering what other pubs round here charge.